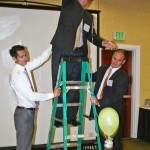 Team members test their egg drop devices. Last week, everyone at Cydcor participated in a team building exercise where we had to create a device that would protect a raw egg from breaking when dropped about 10 feet. We divided into groups of about 8-10 people and given a box of supplies to create the device. We had a limited amount of time and the pressure was on. As we were working on our design, gathering all of our ideas and getting all of our brains in the game, we noticed that other groups were creating a parachute-type tissue. We did not have the tissue. We assumed every team got something different in their box. We ended up creatively using materials such as straws, string and rubber bands to enable our egg to drop as if unwinding a yoyo. What we learned was this: If we lured down the egg, it would never break. As we had seen earlier, many of the other groups had created parachutes. We realized after the time was up that our parachute material was stuck inside the top of the box and we had not noticed. The lesson that was reinforced in the exercise is that it is possible to come up with superior solutions with fewer resources than we think we need. By putting our brains together, we will surprise ourselves by how creative we can be.